The sale of alcohol is a touchy subject in Gallup, N.M. Originally appeared in The Ranger, Riverton, Wyoming. Heading down New Mexico's Highway 666 bound for Gallup isn't always superstitious. The number means nothing to the Navajo Indians, yet it makes tourists giggle. As you near Gallup, it becomes apparent that somebody is trying to sell you something. Billboard after billboard advertises Indian arts and crafts. It has been estimated 75 percent of all Native American goods are bought here in the "Indian capital of the world." Along the highway is an exit that takes you to Window Rock, Ariz., the capital of the Navajo reservation. A large hole was cut in the cliff by natural forces above the president's office. In tribal council chambers, murals are valued at several million dollars. The Navajo Nation has more than 250,000 enrolled members, and its boundaries span across three states — New Mexico, Utah and Arizona — encompassing 17.5 million acres of land. The call themselves the Dine' or "the people." Just outside the city, streetlights make it seem bigger than it is, put in to keep drunks from getting smacked by cars. But Gallup wasn't always this bright. There was a dark period when it was branded "Drunk Town, USA." McKinley County, where Gallup is located, seems confused. Among all the other problems, there is a rift among the merchants: Those who spend their lives devoted to their craft, and those who mass produce the stuff in foreign countries and peddle the cheap imitations to tourists. There has been concern about Navajo weaving dying out. Not that there is any shortage of pride. On the Navajo reservation, some people in the rural areas live in round hogans with doors that face the morning sun on dirt floors without running water and electricity, still clinging to old ways. Yet Gallup is modern. About 90 percent of the country is Indian, and the rest are from every corner of the world, tracing their lineage to the coal mining days during the first part of this century. It might explain why there's a section in the local newspaper called "Home and Hogan." Spanish Conquistadors arrived in the region in 1540 and found the newly migrated Navajos and the Acoma, Hopi and Zuni Pueblo cultures that date back to antiquity. In 1880, David L. Gallup, a paymaster for the Atlantic and Pacific Railroad, established headquarters along the construction right of way of the southern transcontinental route. The railroad workers went to Gallup to get their pay. Perched at 6,515 feet, the town situated at mile marker 157.5 was named a year later. Since June, 30 people from Fremont County, Wyo., have been to Gallup to study what has happened here. Epidemiologist Bernard Ellis was the first to tell Fremont County something it already knew about the nagging, persistent problem of alcohol abuse. "Looking objectively at Fremont County, I would say that the impact of alcohol, and drugs to some extent, puts you at the top or near the top in every indicator we look at every year. If that's not enough to consider seriously the need to be more creative, innovative and effective in controlling the problem, I don't know what else a county member would need to see," he said. Ellis was hired by the Division of Behavioral Health under the Wyoming Department of Health to crunch numbers regarding substance abuse issues. Since then the two counties have become sisters — one with a lot to teach and one with a lot to learn. "That's why I think we wanted to go down to Gallup and look at a community whose problem frankly was considerably worse quantitatively than Fremont County has ever been — but still a place with some similarities in terms of how the problem manifests itself and the level of the problem," Ellis said. Similar to Riverton, Wyo., Gallup was planned around the railroad, got hit hard during the uranium bust, hosts a major balloon rally, features a local college — a branch campus of the University of New Mexico — and is served by a commuter airline, America West Express. It also hosts the annual Route 66 Rally — the historic road that runs through town and was the subject of a "get your kicks on Route 66" 1960s TV show — and there is the Inter-tribal Indian Ceremonial that attracts more than 100,000 visitors a year. Like Fremont, McKinley County has always had a lot going for it, and that was one of the reasons people resisted change — for fear addressing the alcohol problem would spoil tourism. "There were people in the community who felt that what we were trying to do was demean and further ruin the reputation of Gallup. That wasn't the intent," said Dr. Tom Carmany, a retired pathologist who worked for Reheboth McKinley Christian Hospital. "I kept saying that no, the reputation of Gallup is well-established. What you're trying to do is change it. And the way you change it is by doing something positive." Prohibition on the Navajo and Zuni Pueblo Reservation to the south created a market for bootleggers who could charge three to four times the price of store-bought liquor in border towns. They were relentless. They sold to kids and pregnant women, anybody who approached their pickup trucks packed full of alcohol products. A woman called "Juicy Lucy" was a stereotype of the typical and prolific bootlegger and has become a legend in the region. In its infancy, Gallup was a quiet town, but in 1983 it was evident it had a problem. In that year, the town had 39,194 arrests for drunkenness in a town with a population of roughly 20,000. Herb Mosher, director of development for Rehoboth McKinley Christian Health Care Services, remembered some early warning signs. As he put it, truck drivers used to turn on their CB radios and say, "Hey good buddy, want to get some gas in Drunk Town." Exposure deaths were appalling and so frequent police officers began calling them "Popsicles." Some winters the death toll reached nearly 50, and those were just the ones they found. Soon, the media picked up on what became a blood sport or a "vampire's delight," Mosher said. Reporters came in droves, trying to top each other while viewers and readers demanded more. "Let's see, I've got one where he's cut in half by a freight train. Well, I can top that. I've got five of them and the girl's holding a can of Budweiser out the side of the car and they're all dead," Mosher said. An award-winning series in The Albuquerque Tribune took a more serious look at the problem and was followed by national media coverage. By then, Gallup could not ignore the fact it was one of the drunkest places on Earth. But that has all changed. By 1996, protective custody arrests were cut in half, dropping to 17,748. And exposure deaths have also gone down. Last winter, there were eight human Popsicles, and Mosher expects that number to decrease by two this winter. Other indicators — suicides, short-term and long-term effects, and traffic wrecks — are down. Although Gallup is not where it would like to be and consumption remains high, there has been remarkable progress. Walking around town, it is clear people are proud of what has happened. No one seems surprised that people would come from hundreds of miles away or from around the world to study their town. No longer do tourists have to step over passed-out drunks. And no longer is there blood and urine in the doorways. There is also a divide here — those who abstain from alcohol and those who aimlessly walk the streets with confused leather faces that crack open to mumble. Many of them are the same ones who weathered the change and hang out in the alleys, by the railroad tracks, and the walkway near City Hall. They still collect tin cans and donate blood to raise money. The plasma center has moved across town so their walk is a little longer, but they just have to be sober when they get there. Although youths are drinking at younger and younger ages in McKinley County, 16-year-old Jay Chee, an enrolled Navajo, would rather skateboard than fall prey to alcohol. "I just don't like it," he said. Many of his friends feel the same way, yet some of the best places to "board" are where the drunks sit and stare. 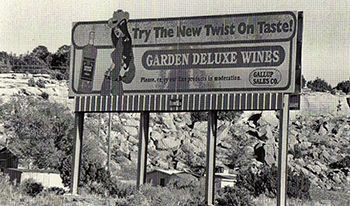 A cheap, locally produced wine called Garden Deluxe is still around, although the manufacturer warns: "Please enjoy our fine products in moderation." Yet, Gallup is different. Changed forever. The tourists aren't so afraid anymore to spend their hard-earned money here. "We may not be Serenity City, but we're no longer Drunk Town," Mosher said. Originally appeared in The Ranger, Riverton, Wyoming. Photo by Nathan A. Ferguson.